Survey says: Alumni predicted that homes will be smaller, more high-tech and more energy efficient. And for the most part, our experts agree. What they mean is that with constant changes to technology, labor and other factors, predicting the future of homes is a tall order. But these Roos and expert faculty are up for the challenge. In the heart of the Crossroads Arts District sits an understated brick building, nestled between an alley and event rental store. Step inside, however, and you are transported to the design mecca that is Studio Build. 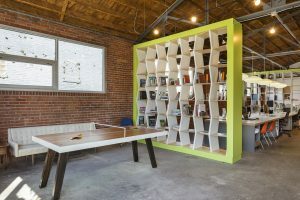 Sleek furniture, exposed brick and floor-to-ceiling bookcases welcome you to the space, as guys in jeans and glasses tap away on Macs. Studio Build began in 2008, but one could argue it really began years earlier, when Jerad Foster and Ryan Deveney sat next to each other in their first architecture class at UMKC. Foster and Deveney continued to work together as they completed the five-year architecture program that begins at UMKC and ends at Kansas State University. Today, they work together — alongside fellow Roo Chris Penland and others — to design and build beautiful spaces across Kansas City. To learn about the future of homes, we talked to these three architects, as well as Joy Swallow, Ph.D., department chair of UMKC’s Department of Architecture, Urban Planning and Design. Chris Penland: I think the millennial generation is going to change housing a lot. People are moving downtown, and that trend is pushing a lot of construction. Smaller, more dense housing is becoming more popular. It’s making our job more fun — we get to do a lot of creative spaces. Joy Swallow: Smaller means, perhaps, less expensive. Cell phones have made everything shrink. Nobody needs a full library in their home anymore, nobody needs the kinds of things that have filled up houses, historically. JF: A lot of our clients have decided to wait [on smart homes], because they see how fast technology is changing. They want to see what things are like in five years, because it’s probably going to be cheaper, and it might be a totally different system. We’re looking at it differently than we did even two or three years ago. It’s changing that fast. Ryan Deveney: I think smart homes are great, but then again, I like technology. I don’t think it will really gain steam until the younger generation is building new homes. I also think people are reluctant to implement some of the technology until they have a better sense of security. CP: There are some really cool advancements coming out in our fields. It’s been concrete, wood, glass for hundreds of years, so it’s cool to see where it’s going to go. I think in the next 10 or 20 years, houses are going to look completely different. JF: The technology is adapting enough to where it’s becoming more affordable. Five, 10 years ago, some of this stuff was just too expensive. And that goes along with the smaller size. It’s much more green or efficient to not heat and cool a huge house. RD: As construction costs get higher, people are going to try to get the footprint of their homes smaller and smaller. People aren’t quite ready to concede square footage to allow for the integration of green technology. Until the cost of the technology comes down, I think a “prep for the future” mentality will continue. If energy costs start to soar and the return on investment comes down, I think people will jump on board quickly. JS: The Europeans are way ahead of us. We’re going to have solar panels, we’re going to have wind power — we’re already seeing that with our appliances. I just see it getting better and better. JF: I think the biggest challenge for housing going forward is probably going to be the labor force. We have an impossible time hiring people right now. It’s going to force a change in housing — whether it’s houses that come in kits that bolt together, or whatever it is. CP: They’re already laser-printing concrete homes in some places. They basically have a computer-driven concrete pour machine. Who knows what’s next? JS: There are still going to be guys and gals on the site, strapping this thing together, but it’s going to be like giant IKEA kits. It’s the intersection of how these components come together that the person on the site will have to accomplish. But will the public accept that? That’s a big question. JF: From what we’ve found, if you’re trying to live in the city and connect to utilities, tiny homes are really not cost effective. The price and the economic standpoint is very intriguing to people, but I think when you take away the TV shows and the cameras, the logistics of what they actually cost is very skewed. It could make sense for people who want to be off the grid or live in more rural areas, but any time you’re trying to deal with cities, it just kind of kills the efficiency. RD: I think tiny homes are definitely a fad. The idea as a whole has great merit, it’s just really tough to execute for what people are willing to spend. We’ve had numerous inquiries from people wanting to build one, but nobody has had an appropriate budget to do it right in our eyes, unless they are capable of self-performing most of the construction. JS: Tiny homes are like a mobile home on wheels. It just has wood siding and looks more traditional. There’s a place for tiny houses, but I think there are neighborhoods that would balk at them a bit. 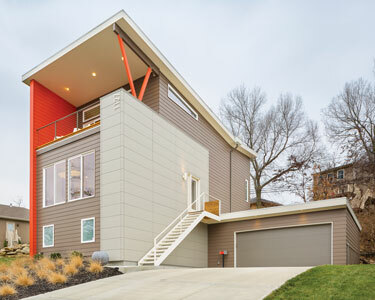 Now, modular homes, they can take all kinds of different figurations. In fact, we have one of the first ones here in Kansas City on Main. It came in on a crane and everything. It’s still costly, but I think the cost will go down with technology.